Jock Dummy is a unique, arcade-style twist on ice hockey. 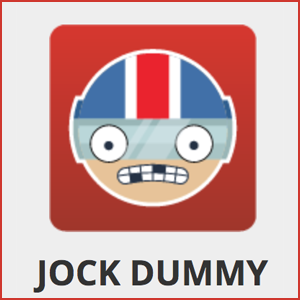 Jock Dummy is an iOS and Android app created by Lefty Games. The premise of the game is that you play as a crash dummy, who slingshots himself toward the net in order to get the puck in the goal a game of ice hockey. It sounds stupid, and it is, but it’s more fun than you might expect. It’s a physics-based game for fans of mini golf games, Angry Birds, and any other game where you have to aim and shoot towards a goal. The ice adds a degree of difficulty, as well as some obstacles that the game throws in your way as you advance through the levels. Jock Dummy consists of thirty six levels, each of them building upon the last and increasing in difficulty. Eventually, you have to face opposing crash dummy players, hockey sticks, spinning fans, and all other sorts of obstacles. Still, it can become addicting to try to beat the level and move on to the next one. Jock Dummy is a simple game that most likely won’t appeal to everyone. Even in its simplicity, however, it’s well designed and worth the free download on your mobile device. If you’re a fan of hockey, or just a fan of games in general, you should find Jock Dummy enjoyable.